In another Veggietales adventure for new and younger readers, The ‘Mess Detectives’ also known as Bob and Larry take on the mysterious case the vanishing carrot. 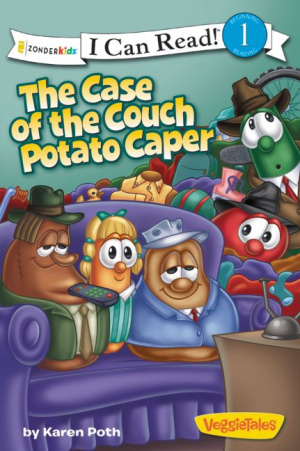 Laura Carrot has been kidnapped by the laziest Veggies ever - the Couch Potatoes. But before the heroic detectives can rescue Laura – from what turns out to be her own laziness and attitude to life, the Mess Detectives must battle those plagues of living room life - snack shooters (between meal unhealthy eating) and a mountain of mess (the untidy habits that stop us getting on with life) that place Laura in grave danger of becoming a Couch Potato too. Laura learns that being lazy isn't so great after all. God teaches us that work is what brings the greatest rewards and helps us make the best of ourselves. Helping out around the house, it turns out, is simply good training for being a top-notch worker for ourselves and for Jesus for the rest of our lives. This Veggie Tale Level One ‘I Can Read’, helps you get children reading on their own and opens up the world of Veggietales stories and Christian books for children aged 4 to 7. The Case of the Couch Potato Caper by Karen Poth was published by Zondervan in April 2013 and is our 7661st best seller. The ISBN for The Case of the Couch Potato Caper is 9780310732136. Be the first to review The Case of the Couch Potato Caper! Got a question? No problem! Just click here to ask us about The Case of the Couch Potato Caper. This Veggie Tale 'I Can Read at Level One' adventure, 'The Case of the Couch Potato Caper', is sure to become a favourite of young emergent readers and their parents and teachers. Mess Detectives Bob and Larry are on the case, trying to save Laura Carrot from the Couch Potatoes and a life of laziness. Combining the ever-popular Veggie humor and characters with strong messages of Gods love and acceptance, The Case of the Couch Potato Caper, a Veggie Tale Level One I Can Read, will be a best seller for the retailer and a best-loved book by the families that purchase them. Join Mess Detectives Bob and Larry as they help Laura Carrot get out of the mess that being lazy got her into. The detectives and their badger help Laura see that the Couch Potatoes are a bad influence, making her ignore her messy room and other responsibilities - even ignoring finding her missing homework!